My all-time favorite heroine is Prime Minister Margaret Thatcher. She was a fantastic warrior for freedom. Her goal was to destroy socialism in Britain and she gave it her all. She succeeded in many ways, but the royal family and the powers that be, much like some politicians in the US, were far too strong and eventually led Britain down the deadly path of socialism. Thatcher claimed that the Labor Party would need to be destroyed to defeat socialism and she was right. But they are still with us today. They took Britain into an Eastern European kind of society just as Thatcher said they would. Thatcher fervently wished for Britain to have two parties like the US does, but our system of two parties is flawed as well. However, it would be an improvement for Britain. Maggie wanted the Brits to believe in the same fundamentals of freedom under the law as we do… backed up by a free-enterprise society. The Labor Party calls itself the party of socialism. Sounds a lot like the Democrats in the US these days. “If those who look at it from overseas were convinced that we would never have a Socialist government… our prospects would be transformed,” Thatcher said. In a way, I am glad that Thatcher and Reagan are not here to see what has happened to the US and Britain. It would break their hearts. Thatcher was referred to as the “Iron Lady” for good reason. She was absolutely fearless and fought socialism, communism and Marxism with everything in her heart and soul. Many hated her for it. I will forever honor her for her fighting spirit and what she stood for. Here in the US we have our own socialist icon these days… Bernie Sanders. He wrote a letter to Thatcher in 1981 decrying Britain’s treatment of the Irish Republican movement. He supports the communistic and violent IRA. That should not surprise anyone. The political front for the Irish Republican Army is Sinn Fein. Sanders is very supportive of them. 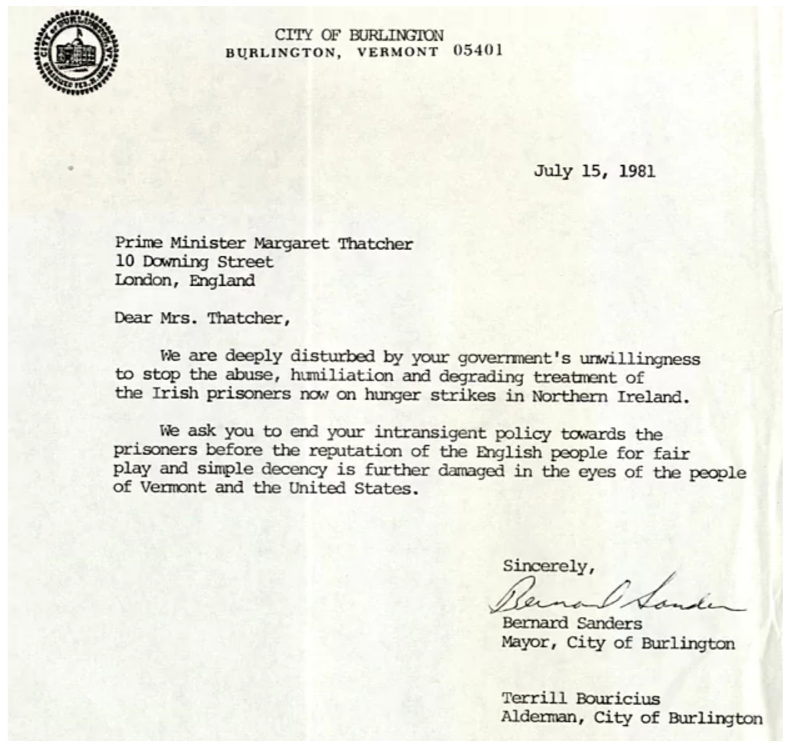 He wrote this letter in July 1981 while serving as Mayor of Burlington, the Vermont town where he forged his political reputation. Sanders is and always has been a radical socialist, who is actually more communist than anything else. When you listen to the video, you will hear the same socialist rhetoric we hear today. It’s still class warfare just as it was back then. Margaret Thatcher was a socialist slayer. She took them down one by one. Someone like Bernie Sanders could no more understand the principles of freedom Thatcher espoused than they can understand basic economics or the Constitution. As Thatcher pointed out, they want everyone equally destitute and miserable. That is the basis for control of the masses. That is a concept that Bolshevik Bernie truly understands. Margaret Thatcher has since passed away as has Ronald Reagan. They were fast friends and the world suffers without their leadership and wisdom. Thatcher will always endure as the Iran Lady. She wept at Ronald Reagan’s funeral and the world wept at hers.